In the first two parts of this feature I've covered the Good Girls of comics Golden Age and the Bad Girls of the last few years. In this part and the next I will look at what I see as the recent positive trend towards strong portrayals of women in comics, a trend that is somewhat reflected in popular media as a whole. The trend, of course, didn't just start a couple of years ago. Rather it is the outgrowth of a number of trends that started years ago, and so I'll start my story in comics' Silver Age. When I was growing up in the 50's and sixties, women in the comics tended to be reflections, shadows or accessories to the men in the comics. Wonder Woman was one of the very few counter-examples, the star of her own book, and not a female version of a pre-existing male hero. Lois Lane, Superman's girlfriend or Supergirl, his teenaged cousin were more typical. Most heroes had a girlfriend like Lois. Some like Hawkman and Antman had female sidekicks. Most superhero teams had a single female member, following the tradition of Wonder Woman in the Justice League (and earlier the Justice Society of America). Many had a villainess who showed up regularly, often his dark counterpart. Batman had Catwoman, Green Lantern Star Sapphire, Iron Man the Black Widow and so on. In superhero teams the women tended to have softer powers, often with an magical or psychic component, where the men had the more dramatically physical powers. In the Fantastic Four, Sue Storm was Invisible Girl, In the X-Men Marvel Girl was a telepath. The Avengers' Scarlet Witch (earlier the Brotherhood of Evil Mutants's Scarlet Witch) had her hex power. The Legion of Super Heroes had Saturn Girl, another telepath, Phantom Girl, Shrinking Violet, Triplicate Girl and Lightning Lass or Light Lass, whose power went from throwing lightning bolts to making things weigh less when her brother, whose powers she shared, returned to the team. During the 70's, though, many of these women became more powerful. Sue Storm, now Invisible Woman could not only turn herself and others invisible, but wielded invisible force fields that seemed to be able to stop anything. She was arguably the most powerful FFer. Marvel Girl, reincarnated as Phoenix, now seemed the most powerful of the X-Men other than perhaps their teacher Professor Xavier. Wealthy Janet Van Dyne, though her powers hadn't changed, had become a stronger character with a life independent of her husband, Dr. Henry Pym. While he runs through a half dozen different identity changes, loses control his powers and his mind, she remains the Wasp, with roughly the same powers, and frequently leads the Avengers. There still weren't many female characters who were the solo stars of their own books, but they had gone from just girlfriends and sidekicks, to partners, team members and team leaders. During the grim and gritty 80's, the many of the women turned dark as well, becoming dangerous femme fatale characters that once had been reserved for the villainesses, the dark nemesises of the heroes of comics early age. Included here are Elektra, mentioned in part 2, Malice, the alter ego of Sue Storm, the Invisible Woman and the Dark Phoenix, who was eventually shown not to be Jean Grey, Marvel Girl, but a cosmic being who took over her identity. 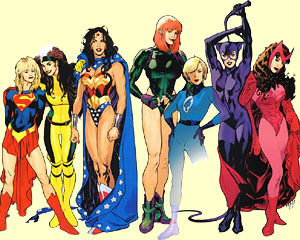 Also included should be the women of the adult Legion of Superheroes. This lead to the 90's, the era of the Bad Girls. At the same time, though, not all the women in comics turned into Bad Girls, and many of the remainder, heirs to the same traditions and subject to the same trends that drove their sisters Bad, became solid characters on their own. After DC's Crisis on Infinite Earths, characters like Superman and Wonder Woman were totally reborn with new present day origins. Like Superman, Wonder Woman returned to her roots. Both were recreated true to their original images, but with a fresh perspective. George Perez and then Mindy Newell and Jill Thompson made Wonder Woman a strong interesting woman, and for the first time women had a strong creative hand in Wonder Woman. (This actually started just before Perez recreated her, when Trina Robbins filled in for four issues between the pre- and post-Crisis series. The fifth page of this series will, eventually, be a review of Robbins's book " The Great Women Superheroes ".) Unfortunately, in 1994 She was remade in the image of the Bad Girls, a "barely clothed hypersexual pinup", to quote Robbins. Fortunately, John Byrnes took over, and ended the bad Girl era. His vision of Wonder Woman was at times a bit ideocyncratic, but he gave us a strong character, even turning her into a goddess. A few months back John left the book and Eric Luke took over the writing chores. So far, his Wonder Woman has been a bit more main stream than Byrnes, but he continues to show her in a strong positive light. Byrne has done many strong women over the years. Another who resisted the Bad Girl trend of the 90's was the She-Hulk, who really hit her stride in John's two-year tenure as writer/illustrator of her book. Beyond her size, strength, brains and green good looks, Byrne gave her the power to see outside her comic book, to deal with him and the other Marvel staffers on the book directly. The She-Hulk used this mechanism both for humor and as a defense against the trend towards "hypersexual pinups". The book had its share of pinup panels, but the She-Hulk would complain about it and set limits, and often she or one of the folk from Marvel would make fun of the readers who were too obsessed with such things. To my eye, at least, they struck a good balance. They also had another interesting strong female character. The She-Hulk's companion and aide-de-camp was Louise Grant, herself a retired Golden Age superheroine, the Blonde Phantom. The slightly overweight, aging Louise was a very authentic character, I thought. Other strong women of the late 80's and early 90's include the Golden Age Valkyrie, brought back in Airboy Comics, Jennifer Mays of the Maze Agency, and the new Dr. Fate, Inza Nelson, wife of Kent Nelson, the original Dr. Fate. The Valkyrie had started out as a femme fatale, a Nazi Ace, leader of an a squadron of women pilots created by Hitler to show that even German girls were superior to the West's finest warriors. The brave heart of the teen-age Air Boy had won her over from the side of evil, and for most of her 40's career she'd been his ally. She could easily have been resurrected as a Femme Fatale or a Bad Girl, but somehow the folks at Eclipse rose above that, making her a strong, more complex character than that. I've written about Jennifer Mays, Ghost, and the Birds of Prey: Black Canary and Oracle in their own pages. Each represents another view of strong women. Similarly, Chance Falconer gives us an excellent view the even rare strong girl. On my next page I'll try to cover the more recent trends, including updates to my reviews of these and other characters.